November 20 is the Solemnity of Christ the King. 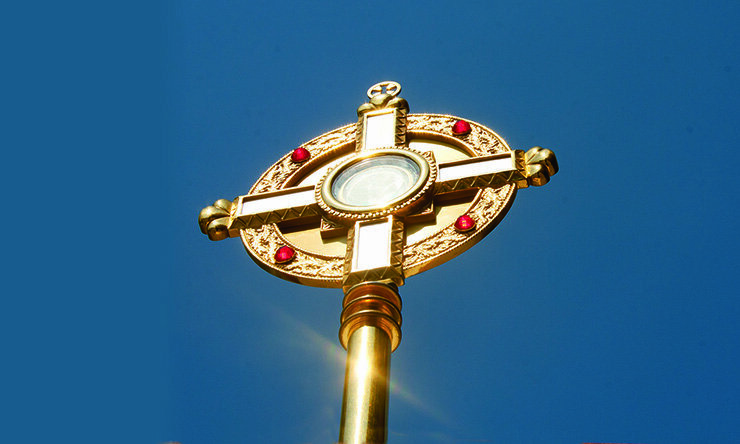 A Eucharistic Procession is to be held following the 10 a.m. Mass that Sunday. The procession will start at the Abbey Church and will have three stops, each representing a different value of Benedictine College. The first stop will be outside of St. Benedict’s Hall, to represent scholarship, the second will be at the new statue of the Sacred Heart of Jesus, representing faith, and the last stop will be outside of Guadalupe Hall, to represent community. This special Mass and Eucharistic Procession is a unique demonstration of our Faith, and a call to discipleship—to follow the Lord in faith. Our Lord will process through campus, bringing His abundant graces and blessings with Him. “He is coming to our town … I don’t care what you are doing, come out and follow Him!” Fr. Simon says, closing his homily with the invitation to us all to follow Our Lord.